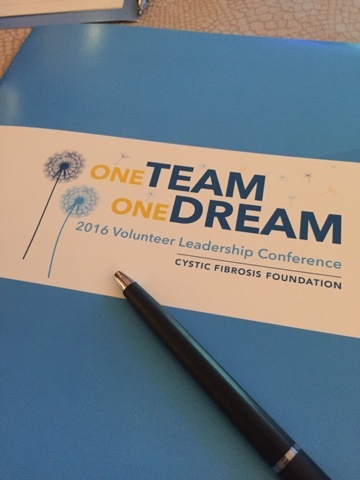 The CFF's Volunteer Leadership Conference (VLC) is an annual networking gathering of CF community parents, volunteers and CFF staff. Each year, I attend to learn more about what the Cystic Fibrosis Foundation (CFF) is up to and to hear the latest on the CFF's effort to find a cure for CF. 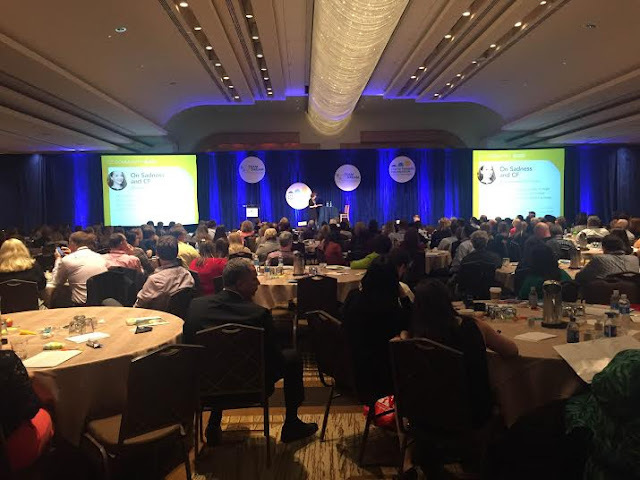 Each year I have attended VLC, I have tried to blog about my experience so others who couldn't attend could still gain the valuable information. 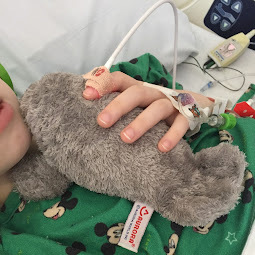 In a previous post, I shared the "State of the Science" in CF and where we are in our quest to find a cure for CF. In this post, I want to share the "State of the Foundation" and where the Foundation stands. There are three main new things to highlight about what's going on in the CF Foundation these days. The first new development is the additional support to Care Centers. The second development is Compass. 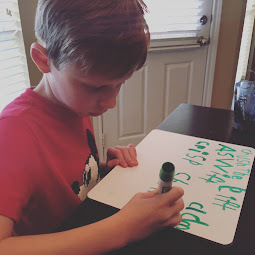 The third thing I wanted to highlight is the variety of ways the CF Foundation is trying to listen to patients voices. 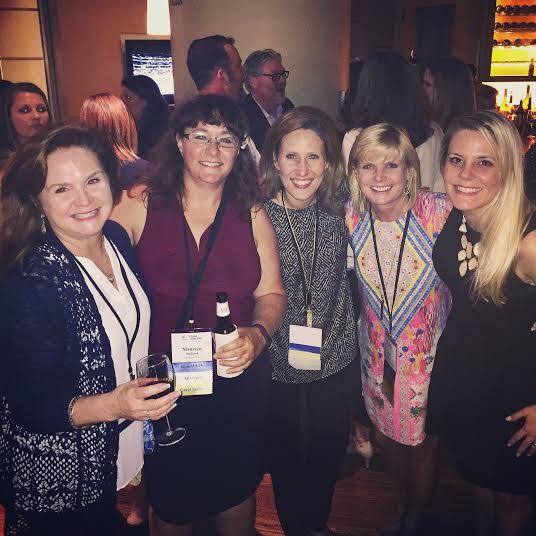 At the end of the blog, I have posted pictures of some of the people I met this year at VLC. Although I appreciate the knowledge I gain at VLC, it's getting to meet the people that I love most. Let's look more closely at the CFF's investment in and additional support for Care Centers. 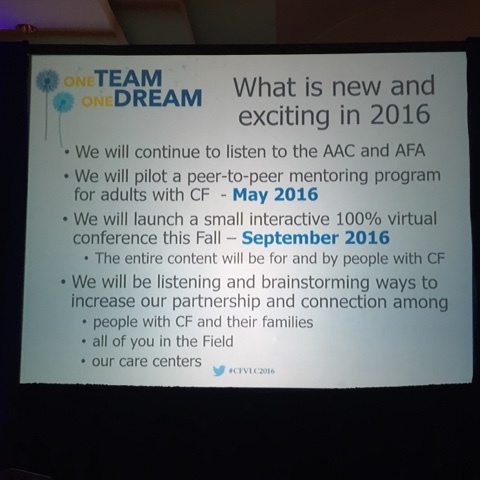 The CFF says they are working to recruit more physicians in to CF care. There are three programs recently developed to help them to do this. The first is a program called PACE which is an effort to recruit adult pulmonologists. The second program is called DIGEST which is an effort to recruit pediatric and adult GI specialists. The third program is called ENVISIO which is an effort to recruit pediatric and adult endocrinologists. 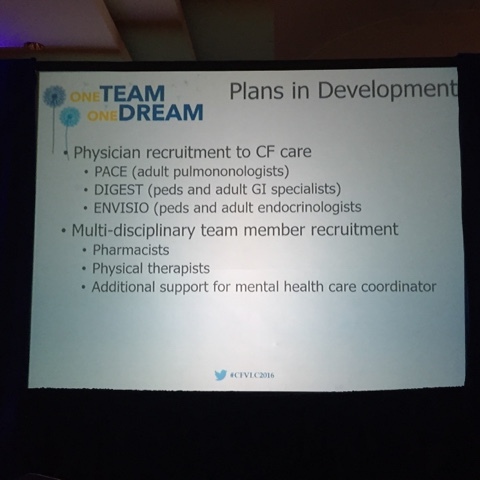 In addition to recruiting more physicians to CF care, there is also a push to recruit more pharmacists, physical therapists and opportunities for mental health care coordinators in the clinic. 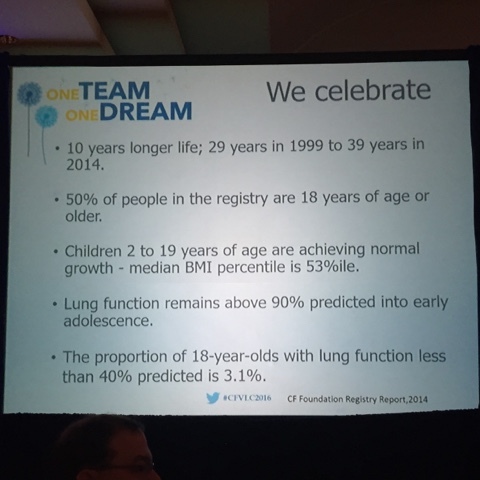 This is great news for our CF community. We need more doctors educated in CF care. The second development I wanted to share is that there is a new collection of services available for the CF community called, "Compass." The CF community has a lot celebrate these days. But as more people live longer with the disease, it has become apparent that living longer with CF brings up new issues. 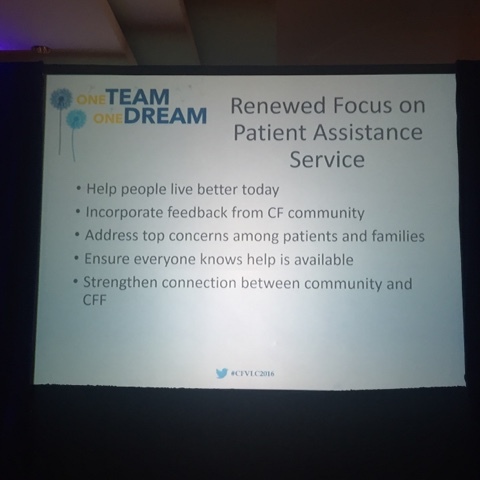 The CFF is working with a renewed focus on patient assistance services. Compass has been created to provide resources life transitions, transplants, living and food expenses, transportation to and from care, housing, pregnancy and adoption, scholarships, funeral assistance, hospice, mold remediation, fitness programs and much more! 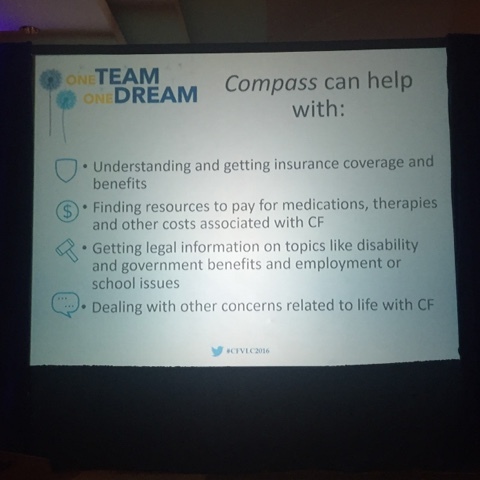 Compass has four main goals - to help with insurance issues, to identify financial resources, to help with legal issues and to find other resources related to life with CF. 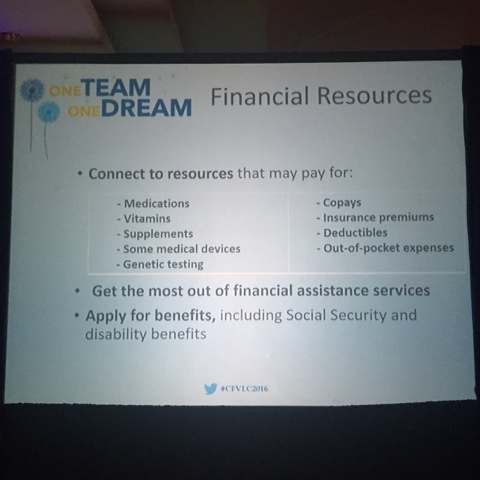 People with CF often struggle with health insurance issues. 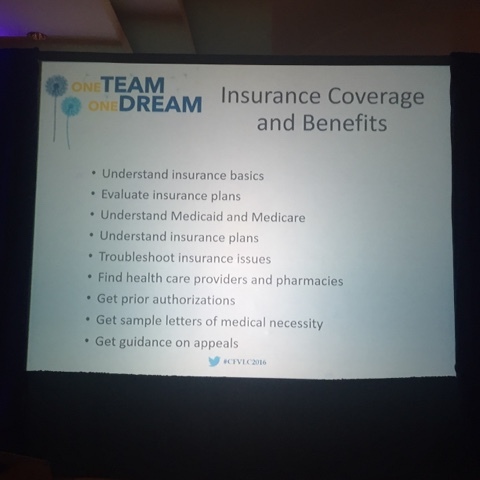 Compass can help with evaluating insurance plans, troubleshooting insurance issues, understanding medicaid and medicare and getting help with insurance appeals. Compass can help with financial resources, such as medication co-pays, out of pocket expenses and applying for social security and disability benefits. The great thing is Compass is for anyone regardless of insurance status or income level. 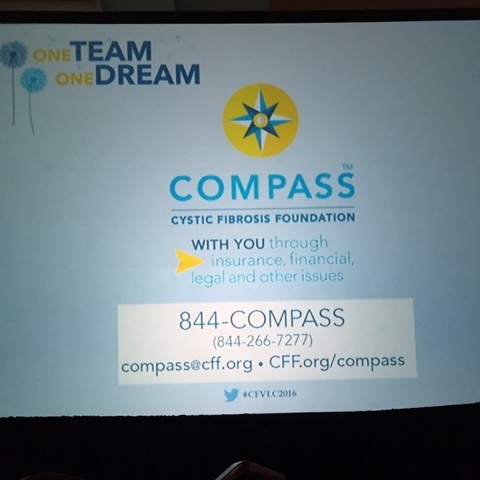 Compass is for people with CF and their families (even the care teams). Compass is always free and confidential. 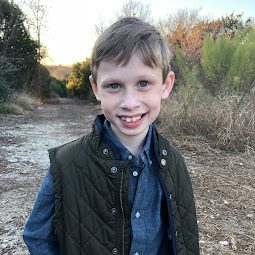 The third development I wanted to share was how the CF Foundation is working to better listen to the voice of people with CF and their families. There will be a peer-to-peer mentoring pilot program for adults beginning in May of this year (the CFF just hired someone to oversee it). There will be a small online interactive conference created by and for people with CF in September of this year. 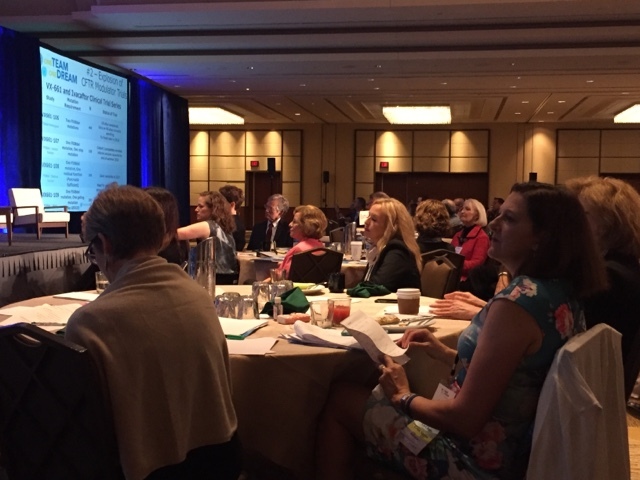 There is also going to be a Pilot Learning Network kicking off this year, which I am intimately involved in, that will begin facilitating better collaboration between clinicians, patients/caregivers and the CF Foundation. I'll share more about this soon but it's connected to the Design Meeting I attended last year: see here and here. I thought I'd share just some of the pictures I took of amazing CF parents and CFF staff members I had a chance to spend time with in DC. These are my friends Cathy and Erin, both CF moms. This is Dr. Bruce Marshall, VP of Clinical Affairs at the CF Foundation. A really great guy, Bruce works daily to improve CF care at the CF Care Center level. 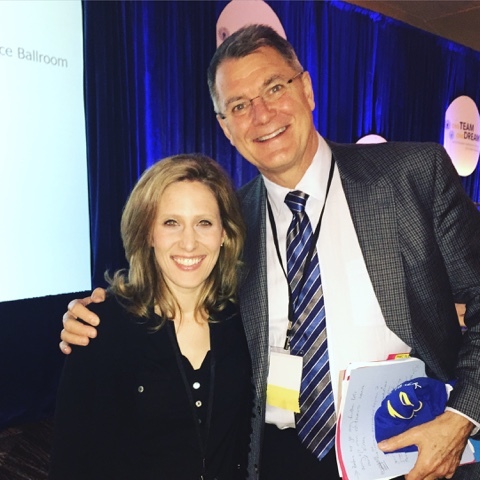 I have had the privilege of working with Bruce on developing the CF Care Model of the Future and working together to improve ways clinicians and people with CF and their families can better collaborate to improve CF care. This is Dr. Preston Campbell, the CF Foundation's new President and CEO. Not only is Preston a really smart guy, he is compassionate and approachable...oh, and, if you can't tell, he's really tall! This is Carin, a CF mom whom I first met online. 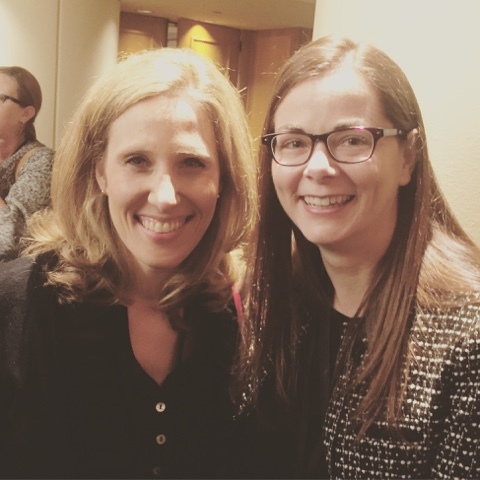 Yay for connected CF Mamas. 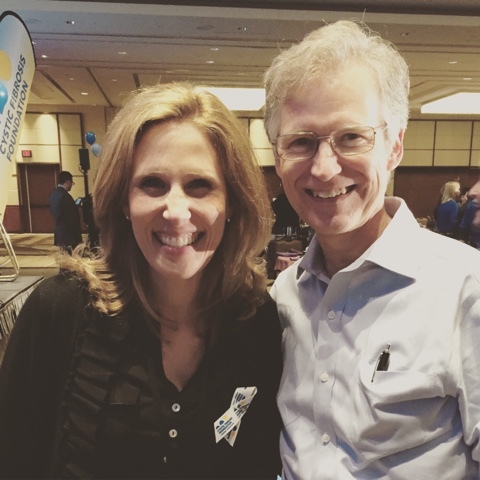 This is Amy, my local CFF Executive Director. I have known her since Bennett was born. She's amazing - dependable, caring and "in it" for all the right reasons. 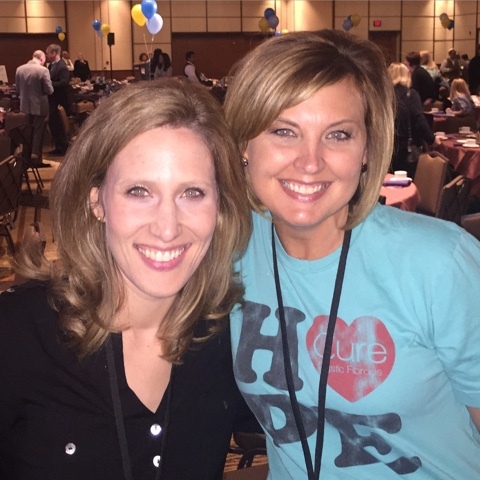 I am so thankful the CF community has Amy and even more thankful to consider her a friend. e.) it's clear he's on a mission and is using every day to improve the world around him (particularly for those in the CF community)! It was nice to meet Andy in person for the first time, introduce myself and for him to say, "oh, I know you!" It feels really great to have an online community that feels as real as in person when you actually get to confirm that you each exist in the flesh. I love these women! 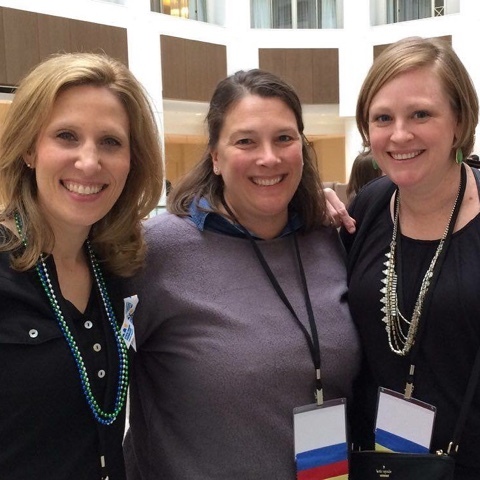 Noreen (left) is a CF mom of a young adult with CF. Maureen (purple shirt) is a CF aunt and a HUGE advocate for the CF community. Kelli (to my left) is a CF mom of a teenage boy. She led VLC the first year I attended. And Mary (far right) is a CF mom of two young boys with CF. 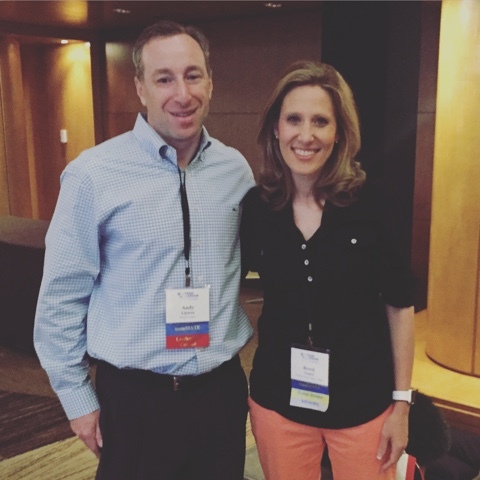 While it can seem like there are lots of CF mamas at the conference, CF dads are represented as well. Jarrod, on the left, is a phenomenal CF dad. 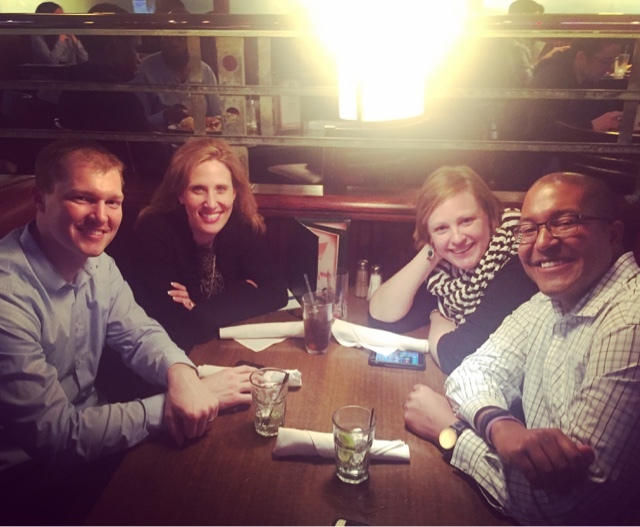 He runs the non-profit 2 Lungs, 1 Fight and recently wrote a blogpost about VLC on the CFF's blog here: https://www.cff.org/CF-Community-Blog/Posts/2016/My-3-Takeaways-From-the-2016-Volunteer-Leadership-Conference/ To the right of the picture is Darryl, a dad of a young boy with CF. Even though Darryl's little boy is young, Darryl is an on-fire CF dad who is going to do whatever it takes to get his son a cure. 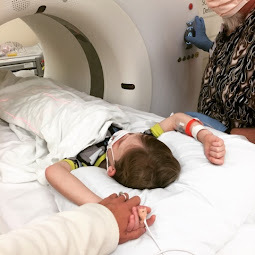 I feel honored to know so many amazing people who are working tremendously hard to find a cure for their children and are, in the process, doing the same for my son.